Death Toll At 80 And Likely To Rise As Storms Slam Mexico : The Two-Way In the mountains around Acapulco, mudslides and floods have killed dozens of people. In the resort city itself, 30,000 tourists are trying to leave — but there are few flights out. Meanwhile, Mexico's Gulf coast is also being pummeled. 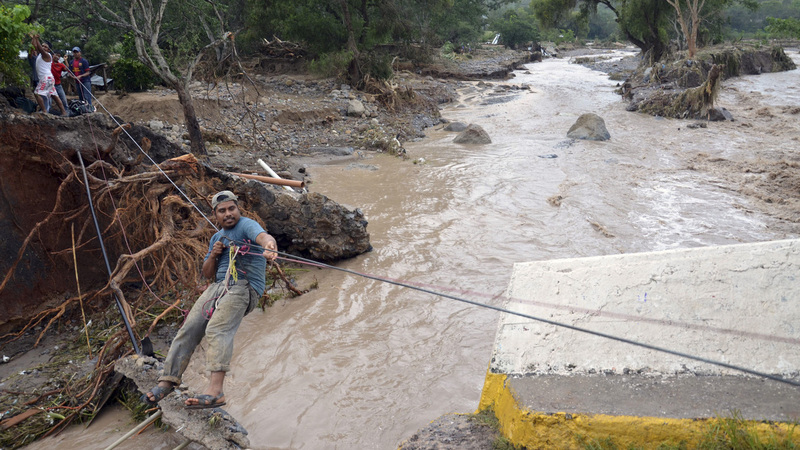 Near the town of Petaquillas, Mexico, a man held on to a line Wednesday as he crossed a stream swollen by rain dumped by the storm Manuel. Mud slides, flash floods and rising waters are proving to be a deadly combination in the mountains near Acapulco, Mexico, where dozens of people have died in recent days as a tropical storm-turned hurricane pummels the area. The storm, Manuel, "was a Category 1 hurricane nearing Mexico's coast early Thursday and [was] expected to produce 75 mph winds and between 5 and 10 inches of rain over the state of Sinaloa," The Associated Press reports. Federal officials raised the death toll from Manuel from 60 to 80 on Wednesday. They said they were not yet declaring that 58 people missing in the village of La Pintada several hours north of Acapulco, were dead. But, it appeared unlikely that they had survived. Meanwhile, Mexico's Gulf Coast is struggling to recover from the damage done in recent days by Hurricane Ingrid — with another storm on the way. On Morning Edition, AP reporter Michael Weissenstein reported from Acapulco that the resort has been cut off because highways to and from the area have been "completely smashed." About 30,000 people — mostly tourists — are "desperate and angry" as they wait to leave on the two flights an hour that are taking off from Acapulco, Weissenstein said. Reuters writes that looting broke out in the resort on Wednesday: "Stores were ransacked by looters who carried off everything from televisions to Christmas decorations after floodwaters wreaked havoc in the Pacific port, which has experienced some of the worst storm damage to hit Mexico in years." This "raw video" that AP posted on Wednesday gives some sense of the scope of the disaster.